Join us for a wonderful week in San Diego for a yoga, surf and fitness retreat. Enjoy your summer break or vacation with a fun-filled week of surf lessons, open air yoga classes, restorative afternoon yoga sessions, guided meditation in the morning or afternoon, Stand Up Paddle boarding, daily supervised fitness and aquatic activities to fill your days in Sunny San Diego! You will stay at our luxury vacation rental in the heart of Mission Beach, situated conveniently in between the bay and the Pacific Ocean. Leave your cars at home, drop your cell phone in your hand bag and bring out your bikinis, yoga mat and your best smile. Your Yoga and Surf retreat will be the perfect summer experience. And for those of you that want to detox and slim down, this is the perfect program to make a positive change in your life! Our yoga retreat is aimed at professional women that would like to enjoy the California lifestyle, have your endless summer days filled with daily activities but still have time to relax and play. Our professionals will take care of your every need from the moment you arrive at the airport. Upon arrival, you will be greeted with a healthy organic detox cocktail and you will receive an Ayurvedic consultation to establish your dietary needs, a fitness analysis from our very own in-house personal trainer and a personalized training program. Our in-house nutritionist will prepare your future dietary consultation and your daily meals with our special pescatarian detox menu based on Ayurvedic principles. 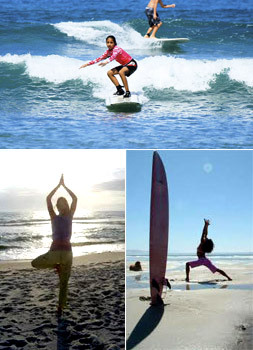 Our surf and Yoga vacation/retreat is a whole new way to enhance your surf experience and lifestyle in Sunny San Diego. * All participants must be 21 years of age and up and must have written authority and consent from your doctor that you are able to participate in our program and have no major health problems. Our retreats have limited availability so we can maintain everything on a personal level. Maximum per group is 8-10 people. The program requires a minimum of 4 hours of activities on a daily basis.